Four bus routes connect tourist and shopping sites. Passport A: Belmont Shore, crosstown from Catalina Landing through Downtown to Alamitos Bay Landing; Passport B: Village Tour, in the Downtown area; Passport C: Pine Avenue/Queen Mary, from Downtown to the Aquarium, Queen Mary, and the cruise ship terminal; Passport D: Los Altos, from Catalina Landing through Downtown to California State Long Beach and Los Altos shopping center. All four Passport routes converge at the downtown Transit Mall (Pine Ave and 1st St), where one can make transfers. Passport B and Passport C are FREE; Passports A & D are FREE only in the Downtown area between Catalina Landing and Alamitos Avenue. The Aqua Bus connects destinations in Long Beach's Inner Harbor and features six "ports of call": Aquarium of the Pacific at Dock 4, The Queen Mary, Shoreline Village at Parker's Lighthouse, Pine Avenue Circle at Dock 7, and the Hotel Maya. Fare is only $1. Aqua Bus Map PDF. 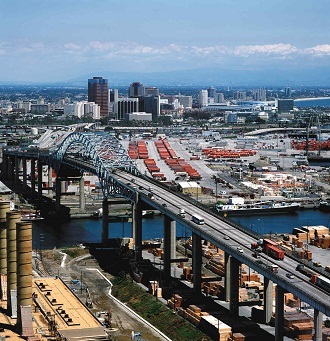 The Port of Long Beach is the second-busiest seaport in the United States and a key transportation hub in the global trade marketplace. More than $140 billion worth of cargo moves through the Port every year – everything from clothing and furniture to machinery and petroleum. East Asian trade accounts for about 90 percent of the shipments through the Port. The Port of Los Angeles is adjacent to the Port of Long Beach. The two ports compete for business, but cooperate regularly on various areas including security, infrastructure projects and environmental programs. Combined, the number of cargo containers shipped through the two ports rank as the world's sixth busiest port complex. The Port of Long Beach is located less than two miles southwest of Downtown Long Beach and approximately 25 miles south of downtown Los Angeles. Carnival Corporation spent $40 million to build a state of the art cruise center at Long Beach. The terminal officially opened in 2012. Accepted forms of payment: U.S. Dollars; major credit cards. No advance reservations required. Due to height restrictions in the garage, RV's may have to utilize the adjacent outdoor parking facilities. $15 per day (rates subject to change by Port Authority). Open 9AM-6PM every day, except December 25 and the weekend of the Grand Prix of Long Beach in April. One of the largest aquariums in the United States, its nearly 1,000 species fill 19 major habitats and 32 focus exhibits and take visitors through three regions of the Pacific Ocean: Southern California/Baja, the Tropical Pacific, and the Northern Pacific. The Queen Mary is a historic Cunard White Star ocean liner whose past includes being a troop transport in World War II and is listed on the National Register of Historic Places. Several different tours of the ship are offered including a Ghosts and Legends tour. The Queen Mary also boasts a hotel, several restaurants and a shopping promenade. A self-guided tour of a Cold War Soviet submarine. A retired Russian submarine officer is at the submarine five days a week to answer questions. Be aware that the passageways and hatches are very small, so this is not for those who are claustrophobic. Housed in the historic Elizabeth Milbank Anderson House - built in 1929. A two-story Monterey-style adobe home built in 1844. A National, State, and Long Beach Historic Landmark, the site includes historic gardens and a research library. Docent led tours on weekends, 1PM to 4PM, self guided tours W-F.
Take a ride on an authentic Venetian Gondola along the waterways to view million-dollar homes on Naples Island. Shoreline Village is a family friendly waterfront shopping, dining and entertainment center that overlooks beautiful Rainbow Harbor. Take Passport C.
Between Cherry St. and Junipero along 4th St.. Home to independent retro and hipster bookstores, clothing shops, furniture shops, and an Independent movie theater, the Art Theatre. Check out La Bomba for its extensive selection (including a literal mountain of clothes in the back of the store that you literally dig through.) Take Passport B.